1. Light the barbecue (I like to cook this over wood, but charcoal or gas work fi ne), or heat a griddle pan over a high heat. Using your hands, lightly coat all the vegetables with 2 tbsp oil. Cook all the vegetables over a high heat (in batches, if needed) and keep turning often, until all sides are charred slightly. There’s no need to cook the vegetables through completely – this process is to give smoky fl avour and can be skipped. 2. Next, make the paste. Pound together the Thai chillies, garlic and ginger in a pestle and mortar to make a coarse paste, using the sea salt as an abrasive. Heat the remaining 2 tbsp oil in a large wok and when hot, add the paste and fry, moving it frequently, until it begins to turn golden-brown. 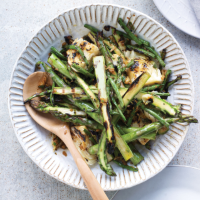 Add the charred vegetables, tossing for a minute or so on a high heat, to ensure that all the vegetables are tender but retain a little bite. Finish by tossing through the stock, soy, sesame oil, white pepper and sugar. All the ingredients should fuse together to create a delicious, light, smoky broth. Serve immediately.